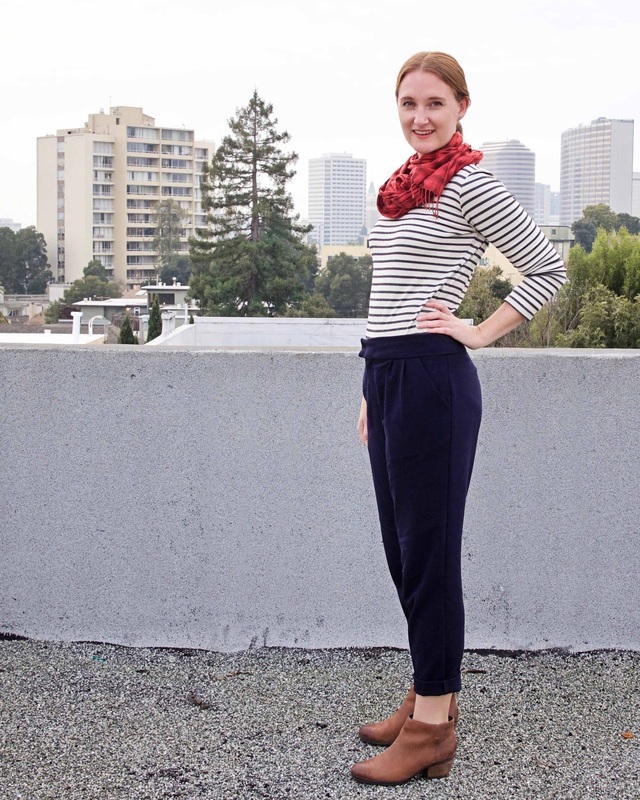 Meet the Lazo Trousers, Thread Theory's second pattern for women and my latest pants obsession. I tend to really trust Morgan, who has a degree in fashion design and works with other really great professionals in the industry. She takes her time to make quality patterns, and in this case has been working on this pattern for over four years - it was inspired by her collection in design school and I first tested it back in early 2015! Even though she is a menswear designer, she worked really hard to fit women's curves, and for me these pants have been near perfection. In the description, designer Morgan perfectly sums up my need for pants: slim trousers designed for a full bum and flat stomach that hug your curves without being too tight and uncomfortable. Her drafting is impeccable, and never have I had a pair of pants fit me this well out of the envelope! The back hangs perfectly from the fullest part of my bum, and the outer side seam slopes gracefully past my knock knees. A beautiful sight to see! In the photo below you can see the stretch fabric bag a little at the knee after wearing them all day, but they hang perfectly down the back and through the knee. Heart eyes. Of course, this doesn't mean that I didn't fit them. I took a 4 inch wedge out of the center back, tapering toward the crotch, which is a major adjustment. It is a fairly common issue for me in pants fitting, as I am very pear shaped and often have gaping back there. Secondly, while the pants are drafted for a fuller bum, I found the top still pulled down in the back, meaning I needed to further increase the crotch depth. Morgan has a nice blog post with this and other fit adjustments for the Lazos. After making these changes to the center back, I adjusted the waistband to match. I brought it in at the sides, but later realized I need to reduce it in the back only - I need that extra room at the front after all those Christmas cookies! You'll also notice that I shortened the waistband. While I like the wide waistband in theory, the narrower waistband was necessary for making some in-progress fit adjustments, and also has a more classic look that I like. I will try that wide waistband someday though! Notice also those little pleats for extra movement and style. Other than the changes to the center back and waistband, they fit very well! I think making them up in a drapey fabric was key. These were made in a polyester/rayon/spandex blend from Robert Kaufman that has a slight bit of stretch and makes them suuuper comfy. The pattern is also similar to my pants block, with an L-shaped crotch curve and legs at the same angle, which helped them fit right out of the envelope. I have so many plans to make more of these. 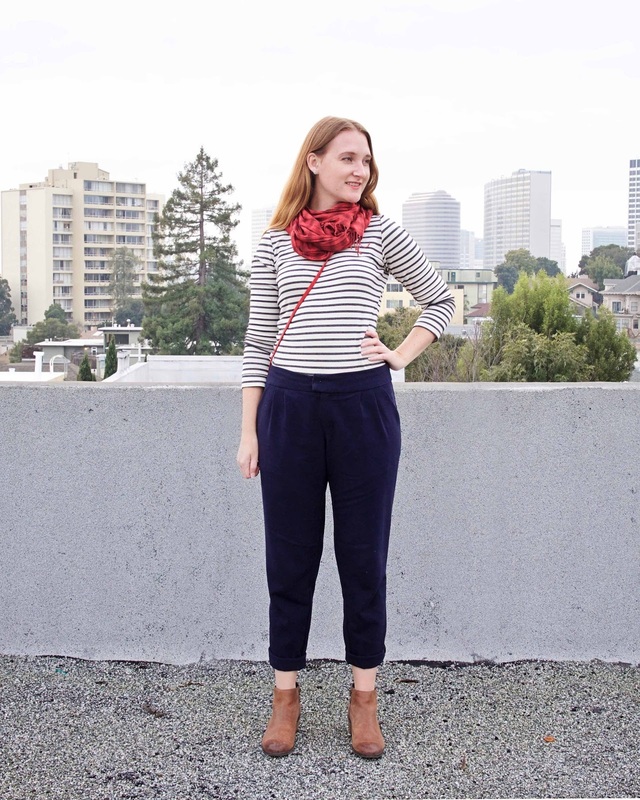 On Instagram, I posted a pattern hack idea for Lazo Trouser overalls, and I would love to make up some more in various colors. In suiting I think they look great for work, and here I have them styled more casually as per this inspiration I've had pinned forever. I am also wearing my new purse that Mr. Made got me for Christmas which I picked out today, although you can't actually see the purse itself in any of my pictures (sad face). 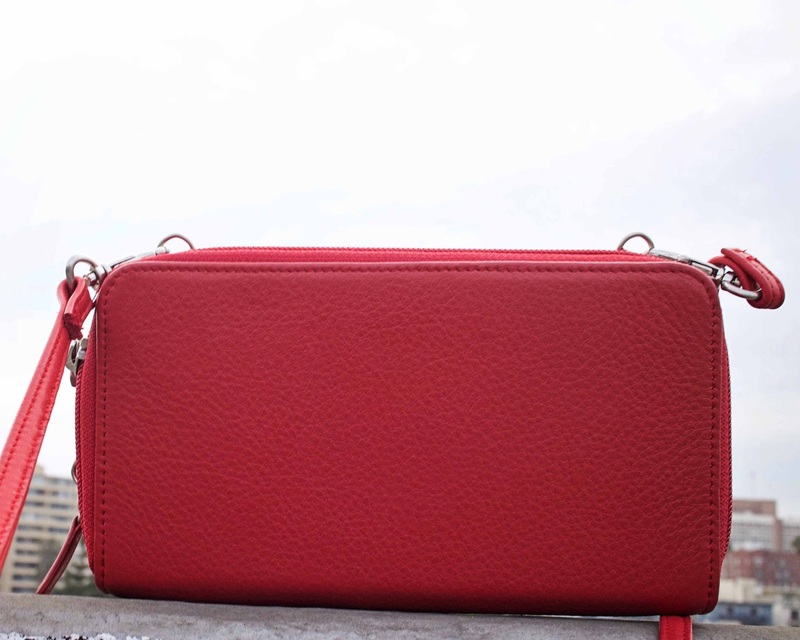 It's from Sven Handbags, locally made in Berkeley, USA from the softest leather. I have so many more sewing plans in progress and on my mind, from a men's bomber jacket to completed motorcycle pants to more Pattern Magic goodness. But the semester is also starting, so let's see what I get done! what a great fit. but are pleated pants making a comeback? they do look comfy. I think they would be nice in a print as well. 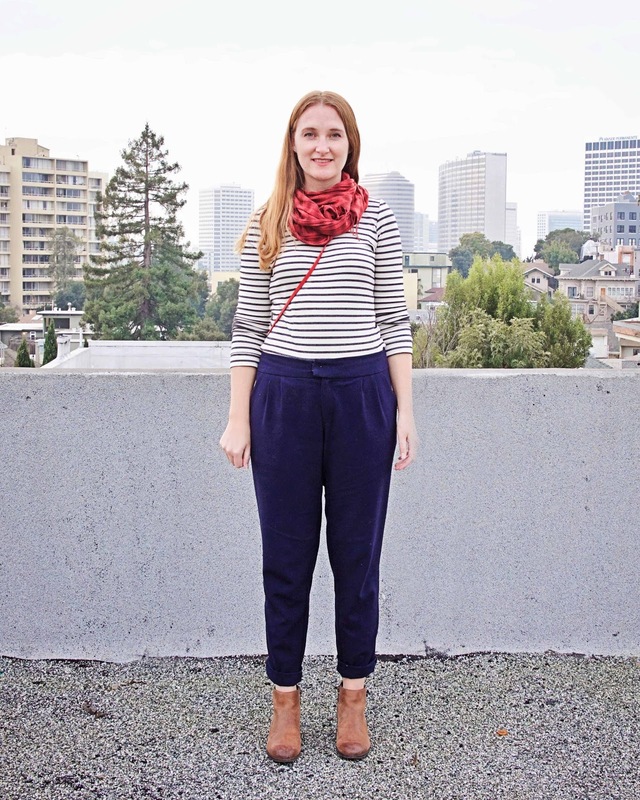 haha I've had a pair of thrifted pleated pants that I just love forever, so maybe?! These look great! Love how you styled them. Curious about the waistband... did you cut it down from the top edge or did you add height to the leg pieces? I've thought of doing something similar, as this pattern is on my list for the spring. Thanks! I shortened the waistband from the top as it was getting just too narrow by the waist. I also ended up having to shorten the legs at the back a bit too because my crotch height was uneven (it was pulling down in the back) but I have fixed this on my pattern pieces for my next version. That is all to say, they sit pretty high at about your natural waist as drafted. I really like your pants. I wasn't sure the lazos were quite my style, but maybe I should rethink it. Yours are fantastic! Those fabric choices sound amazing! I think the drapey fabric worked really well for these.